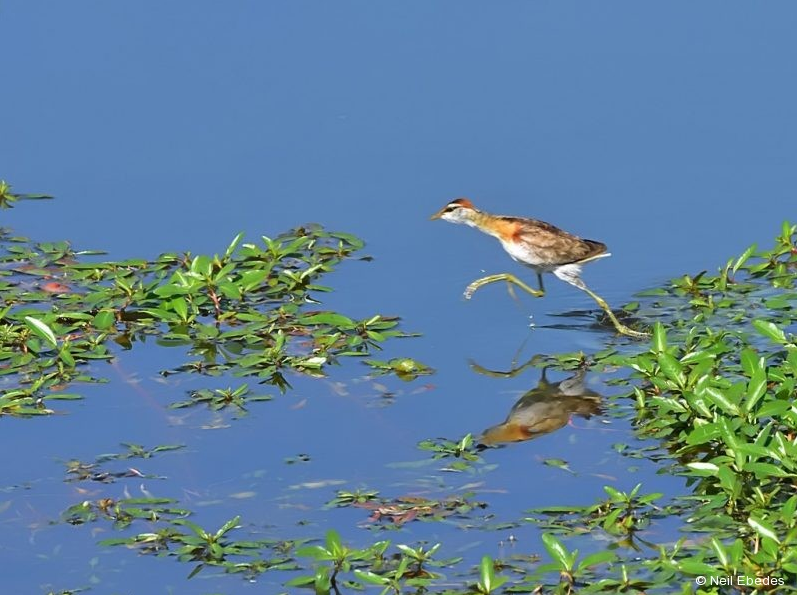 In April 2016, Discover Africa's birding expert Neil Ebedes was fortunate enough to tick enough bird off his ever increasing list - this time spotting the Lesser Jacana at a the Skukuza golf course situated within the wildlife-rich Kruger National Park. Here's his story. 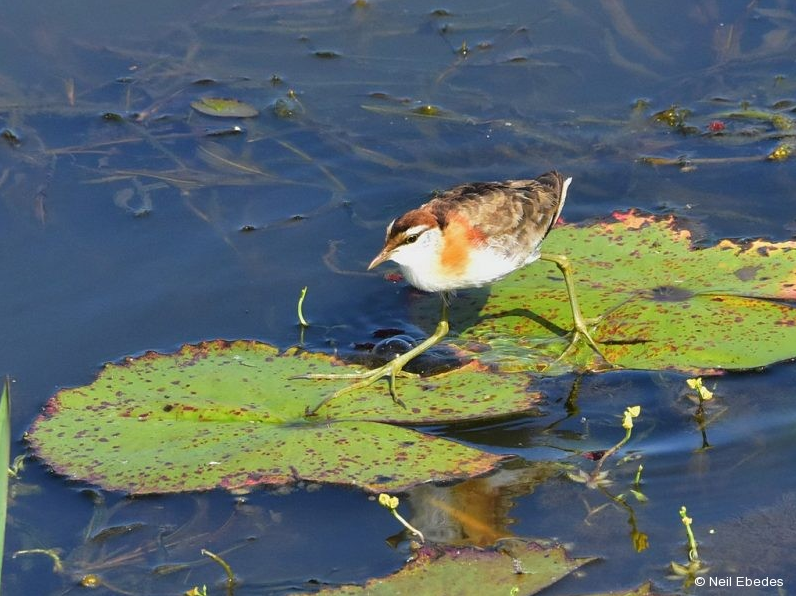 A Lesser Jacana steps on a water lily in the Skukuza Golf Course, South Africa. Image by Neil Ebedes. 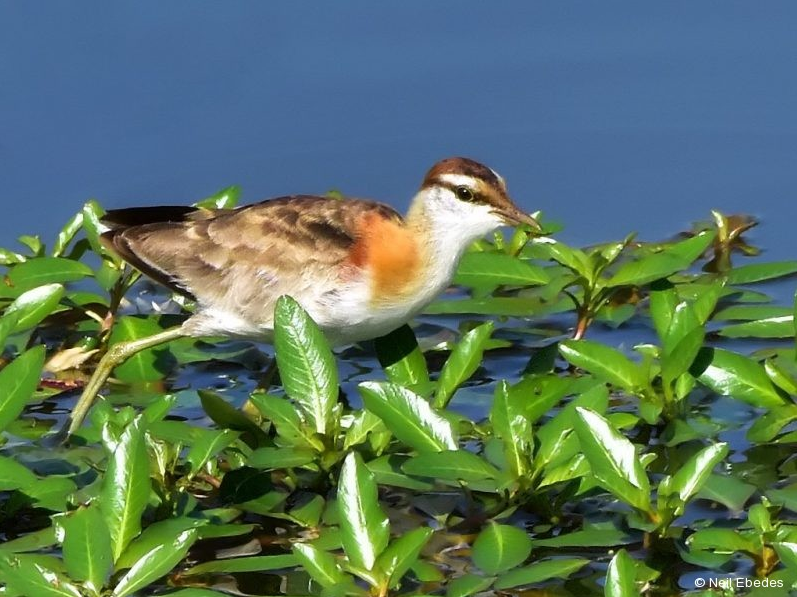 Lesser Jacana: So what’s the fuss? Generally speaking, the ‘Lesser’ of a species is smaller in size and usually difficult to locate. It’s distribution coverage is often quite limited. Colours are similar, but care must be taken when comparing to the juvenile / immature of the ‘Greater’ of the species. Thus when it occurs outside of its customary distribution (SABAP2) it provides a mouth-watering prospect. The Lesser Jacana is usually found in the Okavango and north, as well as the forest / coastal areas of the KwaZulu-Natal east coast, where it is an uncommon resident. A very ‘special’ vagrant. A Lesser Jacana makes its way across a dam in the Skukuza Golf Course, South Africa. Image by Neil Ebedes. The Jacana was announced in Trevor Hardaker’s ‘Rare bird alert’ in April 2016. An outbreak had occurred in various parts of the country, causing quite a stir. One sighting was on the pond / lake bordering the golf course at Skukuza in the Kruger National Park. A friend and I did the trip. The first day was ‘bitter / sweet’ in that while a comparison could be drawn between a Juvenile African Jacana and a possible Lesser Jacana, we had no luck in locating the latter. It was associating with an adult African Jacana, certainly its parent. It seems we were heading for a ‘dip out’. A close up view of the Lesser Jacana spotted at the Skukuza Golf Course, South Africa. Image by Neil Ebedes. In our case, the chances were significantly reduced with only two pairs of eyes searching for a new bird. It’s just not that simple covering a large area searching for one specific species. One that is so well camouflaged to boot. Over the weekend a crowd is in attendance improving the chances. Additional spice was added as the lake is crocodile infested. On the second day, we hit the jackpot, with the bird working and walking on the water lilies near the banks of the ladies tee. These lilies provide such an enchanting view and the photographic opportunities, with the Jacana walking so effortlessly across them, are amazing. The Afrikaans name Dwerglangtoon so aptly describes the bird. Hundreds of shots were taken in the hope that a few would produce that special one, showing off defining features or habits. Under the thatch of the ‘clubhouse’, overlooking the ladies 1st tee, watching the dam infested with crocodiles and having ticked a new bird, was quite relaxing. The beer could not have tasted more satisfying!